The sounding rocket carrying the RockOn student-built payloads launches from the Wallops Flight Facility. Wallops Island, Virginia. 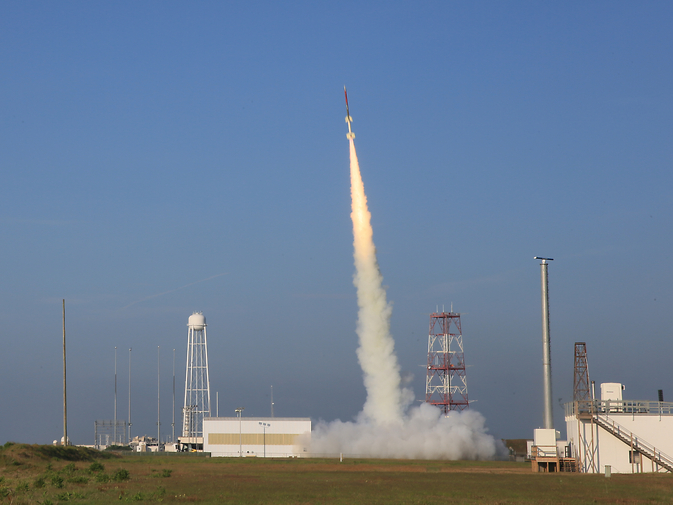 June 26, 2014 – The RockOn Terrier-Improved Orion sounding rocket containing multiple student-built experiments launched successfully today from NASA’s Wallops Flight Facility in Virginia. The launch is part of the 7th annual RockOn! workshop, conducted in partnership with the Colorado and Virginia Space Grant Consortia. The 2014 RockOn! program is giving students and instructors from 61 community colleges and universities across the country an opportunity to learn the basics of experiment design, including programming and electronics. The students have only three days to build their scientific payload, which measures acceleration, spin rate, radiation, humidity, pressure and temperature during the rocket flight. “It’s a hands-on learning experience that will prepare participating students for their future careers in science, technology, engineering, and math (STEM) and provide the educators with information to expand opportunities for students in the classroom,” said Joyce Winterton, Wallops senior advisor for education and leadership development. The launch occurred at 7:21 a.m. EDT. According to preliminary information from NASA Wallops, the payload flew to an altitude of 73.3 miles and landed via parachute 43.9 miles from Wallops Island in the Atlantic Ocean. The payload was recovered and has been returned to Wallops, where the students will conduct preliminary analysis on their experiments later this afternoon. The rocket also carried a group of more complex experiments from the RockSat-C program. These experiments are developed by students, many of whom have participated in a previous RockOn! workshop, from Mitchell Community College, Statesville, North Carolina; West Virginia University, Morgantown; Carthage College, Kenosha, Wisconsin; Temple University, Philadelphia; and Howard University in Washington. Following the launch of the RockOn sounding rocket, the students and teachers who built the payload posed for a group photo and signal thumbs-up to a successful launch.